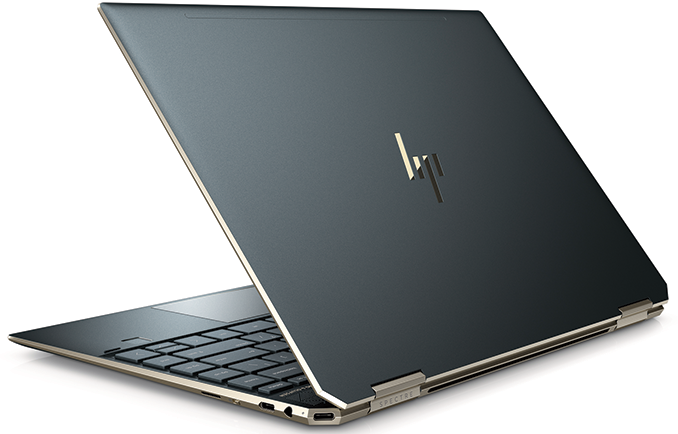 Originally launched as stylish high-performance ultra-portables, HP’s Spectre-series laptops have quickly gained popularity among multiple user segments. As a result of this, HP’s Spectre laptops and convertibles also began to gain features usually found in business laptops to gain further popularity, but did not lose their flashy looks. 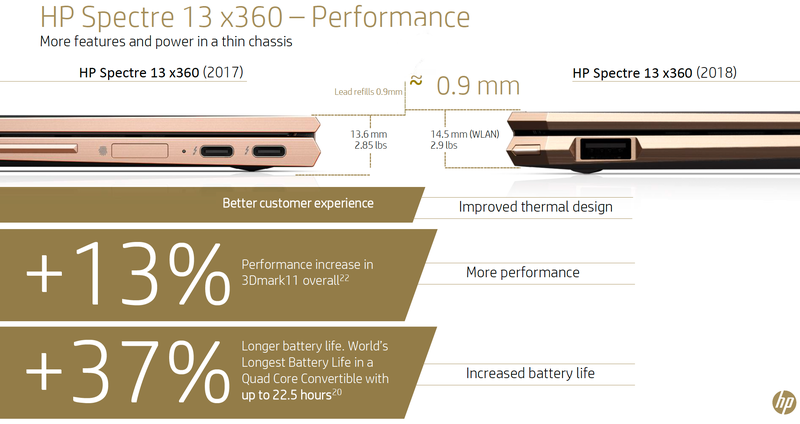 To tha tend, this week HP introduced its new Spectre 13 x360 hybrid notebook that features a combination of style, performance, always-on connectivity, security, and an ultimate battery life of up to 22.5 hours when equipped with HP’s 1W Full HD display. The 2018 HP Spectre 13 x360 comes in a new aluminum chassis with a blue sandblasted finish, and features slightly narrower display bezels inside similar footprint as its predecessor. The key distinctive peculiarities of the new chassis are a new speaker grill, diamond-shape edges, and an angled USB Type-C connector located in the faceted edge on the right. The new chassis not only features a new visual design, but also a new thermal design that allows the hardware to run at higher clocks for a longer time in order to ensure better performance and responsiveness. The better thermals also enable a longer battery life. The new Spectre 13 x360 convertible is 14.5 mm (0.57 inches) thick and weighs 1.31 kilograns (2.9 lbs), that’s 0.9 mm thicker and 22 grams heavier (exact weight depends on the actual config) when compared to the 2017 model. Moving on to internal hardware. The Spectre 13 x360 is based on Intel’s Kaby Lake Refresh platform, with the Core i7-8565U being its top-of-the-range option. The CPU is accompanied by up to 16 GB of DDR4-2400 memory, and an up to 512 GB M.2 NVMe SSD, which is in line with a number of other ultra-portables. As for connectivity, the system is outfitted with Intel’s Wireless-AC 9560 802.11ac Wi-Fi + Bluetooth 5 wireless solution supporting up to 1.73 Gbps throughput over 160 MHz channels, an optional Gigabit 4G/LTE modem, two Thunderbolt 3 ports, one USB 3.1 Gen 2 Type-A connector, a microSD card reader, and a TRRS audio jack. HP intends to offer multiple 13.3-inch touch-enabled display options with its Spectre 13 x360. The highest-end models will come with a 4K Ultra HD IPS panel featuring micro-edge WLED backlighting. More balanced SKUs will be outfitted with a Full-HD IPS panel featuring the same backlighting, and most notably of all, a power consumption of 1 W, which will allow HP to hit upwards of a 22.5 hour battery runtime. 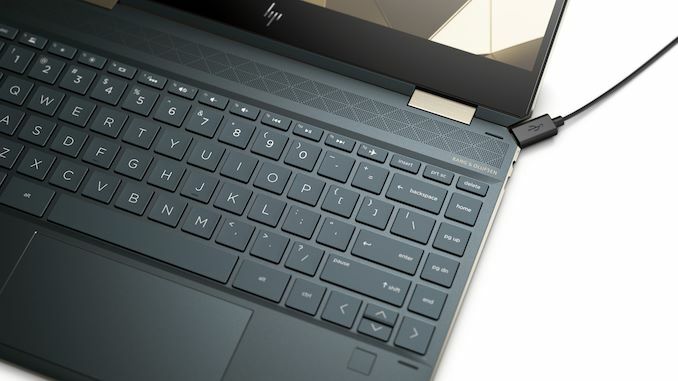 For those who care about their privacy HP will also offer a Full-HD IPS panel supporting its SureView privacy screen technology that prevents those around from seeing what is on the screen. Talking about privacy, it is worth noting just how seriously HP is taking this. Apart from the optional SureView screen, the Spectre 13 x360 comes with a pre-installed TPM module, a fingerprint reader, and a Full HD webcam with IR sensors for Windows Hello that has a mechanical kill switch that disables it electronically. Moving on to battery life, it's important to note that HP only guarantees a ~22.5 hours battery life on systems outfitted with its 1W Full HD display panel. All other models will work for ~13 ~ 14.5 hours on one charge, which is not bad at all, but which is not quite 22.5 hours. As for battery capacity, all the models feature a 61 Wh Li-ion battery, and come with a 65 W power brick. 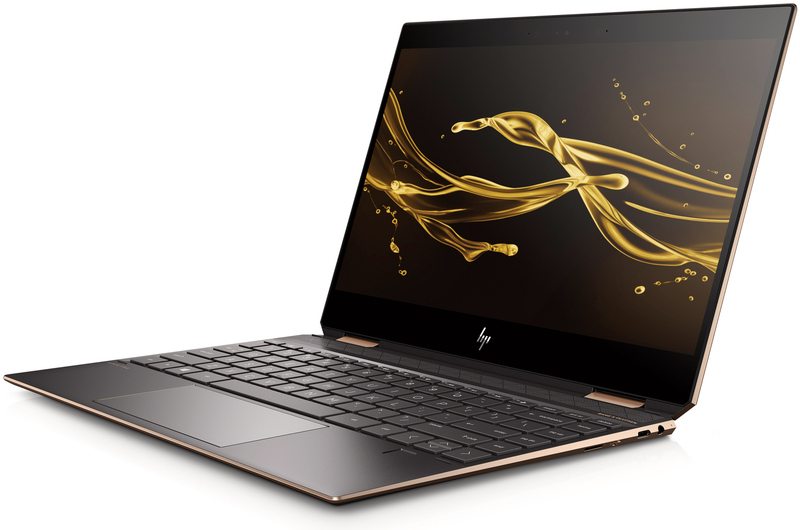 HP will start selling its 2018 Spectre 13 x360 convertible laptop at HP.com in the coming weeks for a starting price of $1,149.99. Retailers will get the new systems sometimes in December. All SKUs will come with an HP Digital Pen. The PCs will be backed by a one-year limited hardware warranty. I would like to see the specs of the "base model" because if it is too "cut down" than that is a high price but then again I suppose if that "cut down" model is also the one that has longest battery run time (did they test max bright..I hate when they do not state what they base the run time on >:() that would be acceptable. did not see way to edit...also, cool they make thinner and thinner and claim "better cooling" but more oft then not leads to thermal throttling and poor keyboard design because they try to cram it all in a small a place as possible with no structural stability/durability. I have the 2017 Spectre X360 13", which is slightly thinner than the new model. There are no issues with thermal throttling, but that's due to the i5-8250u having strict power limits. Even with an undervolt it will only sustain 2.6-3.0ghz across four cores. Honestly you'll get that force regardless. If the cord goes to the right or left anyway with a straight connector and is tugged that force isn't going to be in line with the cord, it's going to pull it just like a 90degree connector. I agree with the OP it would be a neat feature, one of the hassles with laptops is it always seems the power port is on the wrong side for your situation and I can count on one hand the number of times I'm plugged straight out from the laptop, it's almost always directly to one side. It looks like HP only offers W10 home on all of their Spectre laptops; which means that despite the upgraded feature set it views them as only consumer products. OTOH you can buy an upgrade to Pro in the MS store for $99 and install it via windows update.